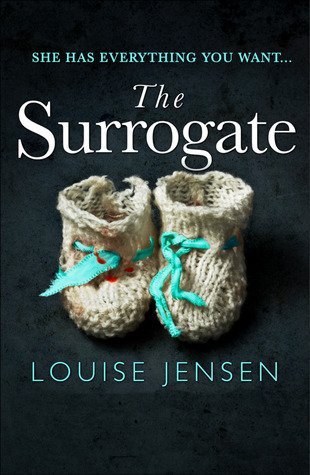 Excerpt – The opening of The Surrogate & my thoughts on THAT end! My third novel, The Surrogate, was published a few days ago and I wanted to share the opening with you. I had such a fabulous time writing this book. The story of Kat and Lisa was definitely one where I thought I knew where it was going, but the characters grew darker, the plot more complex and the twists and turns gather pace until the end hit me like a sledgehammer. I never saw it coming and once it was written, it was great fun to go back and plant the clues for readers, although judging from the over 100 five star reviews it’s already amassed no-one has yet predicted the ending either (BIG thanks to all who have reviewed). It’s the most intricate story I’ve written, everyone in this book has a secret. The e-book has now been selected as part of a special promotion so you can grab it for £0.99/$1.30 across all digital platforms. You can find it on Amazon here. There is a rising sense of panic; horror hanging in the air like smoke. ‘They’re such a lovely couple. Do you think they’re okay?’ says the woman, but the flurry of emergency service vehicles crammed into the quiet cul-de-sac, the blue and white crime scene tape stretched around the perimeter of the property, indicate things are anything but okay. She wraps her arms around herself as though she is cold, despite this being the warmest May on record for years. Cherry blossom twirls around her ankles like confetti, but there will be no happily ever after for the occupants of this house, the sense of tragedy already seeping into its red bricks. Her voice shakes as she speaks into the microphone. It is difficult to hear her over the thrum of an engine, the slamming of van doors as a rival news crew clatters a camera into its tripod. He thrusts the microphone closer to her mouth. She hooks her red hair behind her ears; raises her head. Her eyes are bright with tears. TV gold. Disdain slides across the reporter’s face before he rearranges his features into the perfect blend of sympathy and shock. He hadn’t spent three years having drama lessons for nothing. He tugs the knot in his tie to loosen it a little as he waits for the woman to finish noisily blowing her nose. The heat is insufferable; shadows long under the blazing sun. Body odour exudes from his armpits, fighting against the sweet scent of the freshly cut grass. The smell is cloying, sticking in the back of his throat. He can’t wait to get home and have an ice-cold lager. Put on his shorts like the postman sitting on the edge of the kerb, his head between his knees. He wonders if he is the one who found them. There will be plenty of angry people waiting for their post today. ‘Late Letter Shock!’ is the sort of inane local story he usually gets to cover, but this… this could go national. His big break. He couldn’t get here fast enough when his boss called to say what he thought he’d heard on the police scanner. He shields his eyes against the sun with one hand as he scouts the area. Across the road, a woman rests against her doorframe, toddler in her arms. He can’t quite read her expression and wonders why she doesn’t come closer like the rest of them. At the edge of the garden, as close as the police will allow, a small crowd is huddled together: friends and neighbours, he expects. The sight of their shocked faces is such a contrast to the neat borders nursing orange marigolds and lilac pansies. He thinks this juxtaposition would make a great shot. The joy of spring tempered by tragedy. New life highlighting the rawness of loss of life. God, he’s good; he really should be an anchor. There is movement behind him, and he signals to the cameraman to turn around. The camera pans down the path towards the open front door. It’s flanked by an officer standing to attention in front of a silver pot containing a miniature tree. On the step are specks of what looks like blood. His heart lifts at the sight of it. Whatever has happened here is big. Career defining. Coming out of the house are two sombre paramedics pushing empty trolleys, wheels crunching in the gravel. The woman beside him clutches his arm, her fingertips pressed hard against his suit jacket. Silly cow will wrinkle the fabric. He fights the urge to shake her free; instead, swallowing down his agitation. He might need to interview her again later. ‘Does this mean they’re okay?’ asks the woman, confusion lining her face. The trolleys are clattered into the back of the waiting ambulance. The doors slam shut, the blue lights stop flashing and slowly it pulls away. From behind the immaculately trimmed hedge, hidden from view, he hears the crackle of a walkie-talkie. A low voice. Words drift lazily towards him, along with the buzz of bumblebees and the stifled sound of sobbing. I wrote this opening genuinely thinking I knew who the bodies would be, and why but as the characters developed and took over the story I found it almost out of my hands. The reveal shocked me and just when I thought I’d finished writing the final twists come in the Epilogue. I felt so drained after writing this book. I hope as well as being entertaining, I’ve also sensitively handled the emotional side of a couple longing for a child. I do hope it’s a thriller with a real heart. Buy it now for £0.99/$1.30 across all digital platforms, including Amazon here.